We all know how much a pair of athletic shoes can impact what you are doing. We don’t wear a pair of shoes sprinters wear if we are playing basketball. Jordan will tell you that. Crossfit is no different and it’s due to the complex combination of skills you are presented with on a daily basis. For this job Crossfit Reebok Shoes were developed. Here’s what a little study I found came up with. It has to do with running, but the stats are quite close to other sports. The study states that 85%, yes 85% of people are not wearing the proper shoes. You can increase your performance with what is on your feet as well as prevent yourself from getting hurt by simply putting on the right shoes. As I said above, you don’t see a sprinter wearing walking shoes to a race. You don’t see someone out for a walk wearing a pair of soccer shoes, or at least you shouldn’t. The point is, you can’t do what you are doing without the proper shoes and it’s pretty clear you can’t. Athletic shoes are designed for the specific needs of a specific sport because it works. Athletic shoes are designed with ankle support like you see in Basketball, with cleats on the bottom and a sturdy sole like a soccer shoe, and a combination of a lot of sports go into creating the Crossfit shoe. 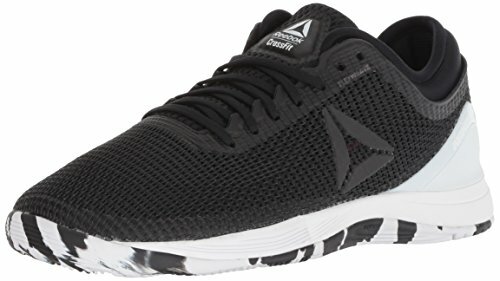 The Crossfit Nano by Reebok is the most popular Crossfit shoe and began in 2011 and has evolved to what it is now with the Crossfit Nano 8. Crossfit specific shoes are important for many aspects. They help with balance and form and therefore reduce your risk of injury. They also support your body around your knee joints and ankle joints. Crossfit shoes are well-built and designed to last through many Crossfit WODS when most other shoes will give out . I remember having new pair of runners in my bag when I realized I had forgotten my Crossfit Nanos. I just about freaked out, but put them on rather than not do the workout. Rope climbs were part of the workout and they are particularly hard on shoes. By the end of the workout the sole of my left shoe had been ripped open at the arch and was flapping about. They were new and now they were trash. Crosfit is very unique in what it requires it’s athletes to dawn as protection. For those who want to push limits, Crossfit is a sport that exposes one’s body to extreme stress and requires right shoe. If you think it’s only your muscles that endure tremendous amounts of stress during a Crossfit workout you would be wrong. Your knee joints, hip joints, and your ankle joints. At the very core of proper body form, and depend on a shoe with proper support for whatever you many be doing at that time. I gave an example earlier of a normal pair of running shoes I wore doing rope climbs. The sole tore across the middle of the shoe because it wasn’t designed to handle the forces Crossfit put on it. Crossfit shoes are designed and have undergone years or development to be this tough. Crossfit shoes have a flat wide sole in particular in the toe area. This is because of the balance required during these activities. Stability is at the core of a lot of Crossfit moves and without balance performance and safety are compromised. You will also have to quickly move from one activity to another and your shoes must be there with you. A CrossFit shoe is light and very flexible. It has a lower heel height for lower stability and the prevention of ankle sprains. Many newer shoe styles known as “minimal shoes” are designed particularly for cross fit with less material and less sole. The CrossFit shoe has a more solid material that makes up the upper portion of the shoe and wraps around the foot to provide a more solid fit. This helps the foot to remain in one position inside of the shoe. Olympic weight lifting is a major part of Crossfit. A workout may have running, pullups, and then an Olympic lift or two and do all this 4 times. For lifting you need the proper support from your shoes, support a regular running shoe simply is not designed to do. Getting through a workout such as gave as an example of makes you extremely fatigued, form suffers and and you rely on your shoes even more. Once you begin getting fatigued, your form begins to suffer a little, and your joints get tired, ankle rolls are very common for those not wearing Crossfit designed shoes. The supportive, wide sole helps prevent ankle rolls very effectively. I hope I have described a little of what Crossfit shoes are all about and proved to you that they are necessary to completing the skill successfully and safely. You will quickly learn to love your Crossfit shoes. You only have so much to give during any CrossFit workout. But if you’re wearing inappropriate shoes you’re leaving some potential effort on the table. Get the right shoes and access all the energy at your disposal. This was quite an interesting review to read. I never really thought about the impact the right type of shoe might have on an activity, so thank you for pointing that out! Also I appreciate that you pointed out the differences between a regular running shoe and the benefits of having a real crossfit shoe. Thanks for a very informative post on the types of shoe to be worn during the sport of crossfit. It really amazes me that a shoe could be this important in preventing injuries. It will be a few months before I can get back to any type of fitness training due to a broken leg. Now I know how important shoes are I will make sure I am wearing the right shoes. Great article! I actually used to work for a running shoe store and I would fit people to the right type of shoe based on their gait and stride. I really enjoyed it–you’re right that most people are not in the right shoe and have no clue! Most people also do not replace their shoes when they should be replaced. I know I’m guilty of it, too–they’re expensive. But it’s important to replace once they’re worn out to protect yourself against injury. Thanks for the great comment. Awesome! Hello, thank you for your informative review. I appreciate the way you pointed out the differences between a regular running shoe and the benefits of having a real crossfit shoe.I have shocking story regarding the use of non perfect kind of shoe for work out. I can’t see my toes nails now . i have been doing gymnastic with regular shoes and i got accident of losing all my nails. I abandoned the gym due to that incident but i think i get the answer to my problem. Yes, crossfit Reebok Shoes. wow these shoes do look really good. I really had no idea they ya shoes specially fofor CrossFit, but after reading you article I can see why they do and why you NEED them. Having never bought a pair, I have a couple questions. First of all how much does a single pair go for, and secondly about how long does a pair usually last until you’re should get them replaced? Home Many thanks or this post showing us the difference between Crossfit shoes and other athletic shoes and the fact that a particular shoes should be worn for particular sport for example, not to wear a pair of sprinters when playing basketball. It’s a good idea to have a specially made Crossfit Nano 8 for the combination of sports in Crossfit; no doubt this helps with balance and form for this type of sport. Its true performance and health benefits are associated with what’s on our feet. One reason that prevents many people from taking part in regular sports activities is the unpleasant pains around the ankle and joints experienced. Now we know the drawbacks when the wrong shoes are worn for a particular sports activity. It’s also good to know that most fitness workouts require a lot of hard work and dedication for maximum results.